You are currently browsing the tag archive for the ‘best drift fishing in palm beach’ tag. 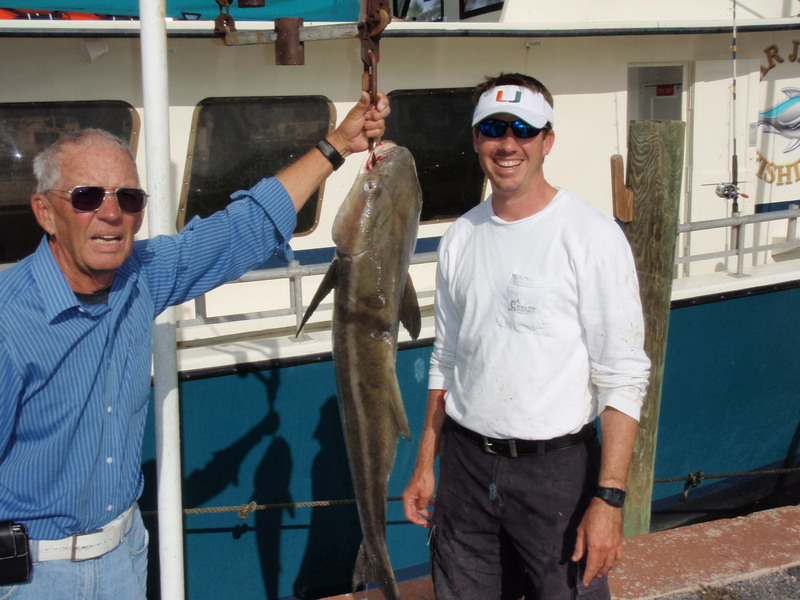 VIP angler Lee (l) stands next to his Cobia with Captain JJ (r). 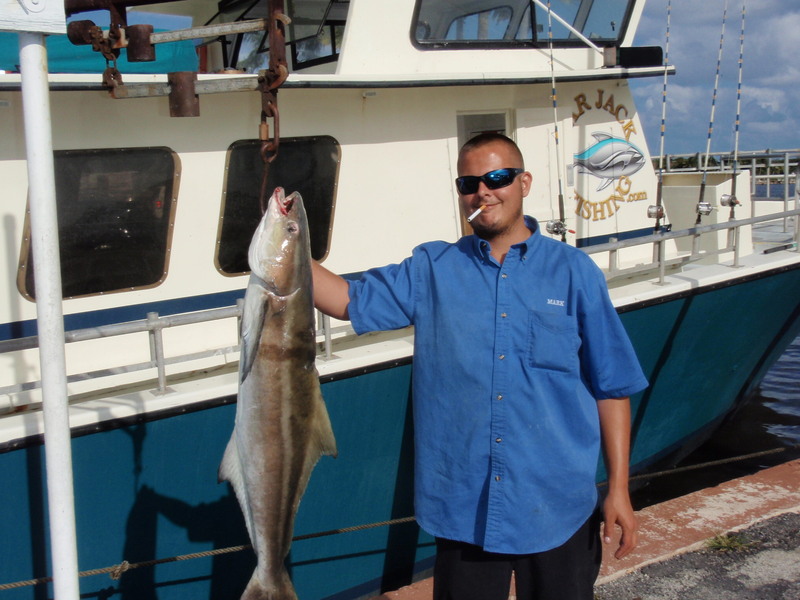 This Cobia tried to elude capture by winding the line around the rudder and propeller of the Lady K. Captain JJ reacted quickly and dove into the water, unwrapped the line from the obstructions, then climbed back on-board the Lady K and gaffed the fish for Lee. Now that’s dedication to customer service! Excellent job gentlemen. 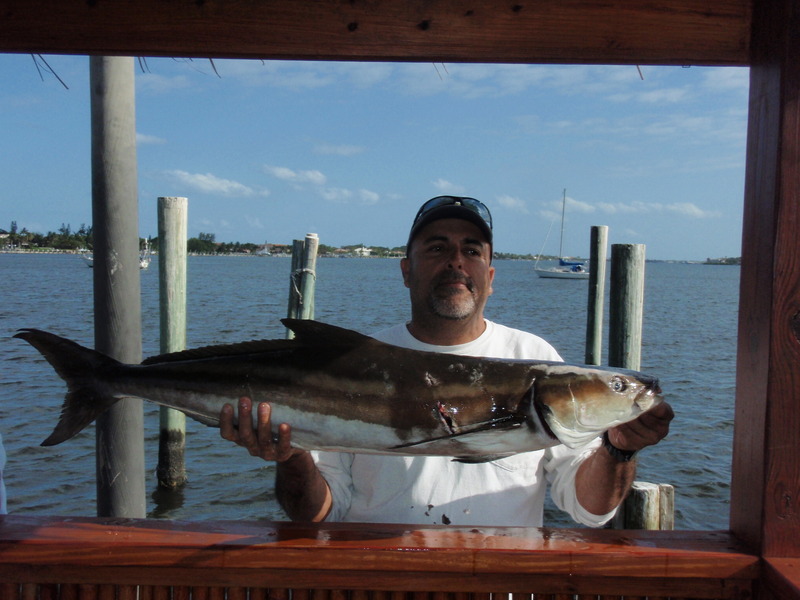 Edwin shows off a nice Cobia at the tiki before the fish goes under the knife in preparation for its dinner invitation. Mark is proof that the more time an angler spends on the water, the better the rewards can be. 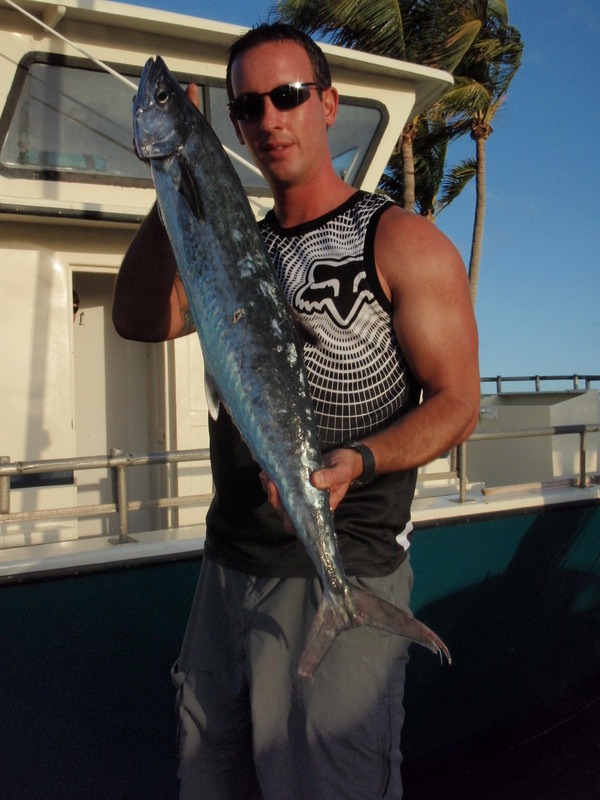 Mark caught his fish while using a knocker rig baited with a sardine and bouncing it along the bottom. Keep up the good work Mark. 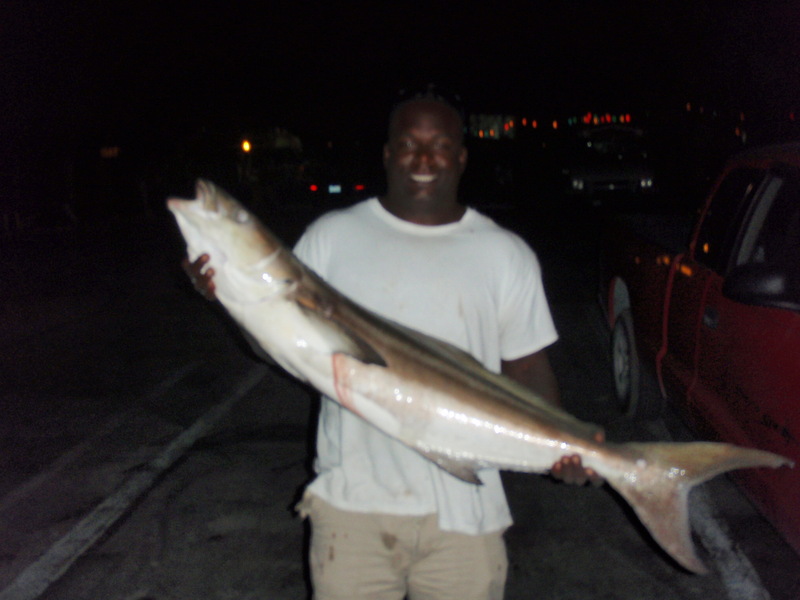 VIP angler Reggie nailed this 40 plus pound Cobia while fishing on one of the Lady K’s evening trips. 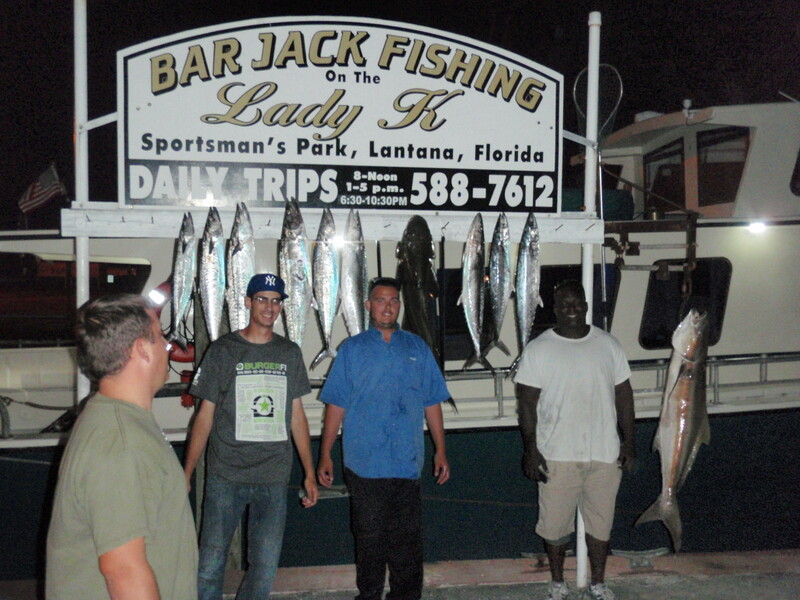 As the picture below shows, other anglers also enjoyed catching King Mackerel and Cobia. Fishing under the lights, another relaxing way to end the day. Among the King Mackerel and Cobia are plenty of Bull Sharks with quite a few Hammerhead Shark sightings this week. There have been plenty of big fish getting eaten by these large predators so hang on tight and be prepared for the unexpected. Also anglers visiting for the first time have had many opportunities to witness large sea turtles basking and breeding at the ocean’s surface while in preparation for their nesting season. 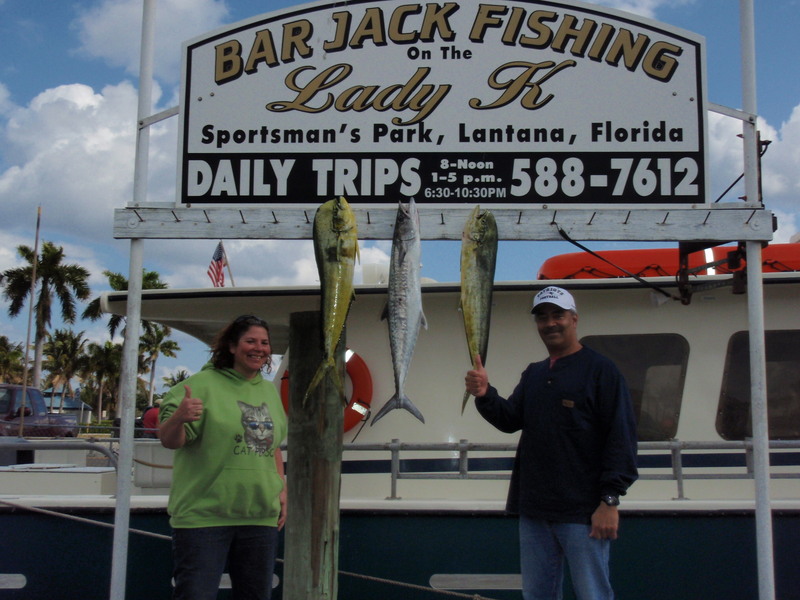 See what wonders await you today while fishing aboard the Lady K.
Gary and Lisa caught a nice pair of Mahi Mahi and a nice King Mackerel while visiting from Lynn, Massachusetts. The couple fish aboard the Lady K once every year while visiting relatives. It’s the excellent service which keeps them coming back for more. Wonderful catch folks and we can’t wait to fish with you again next year! 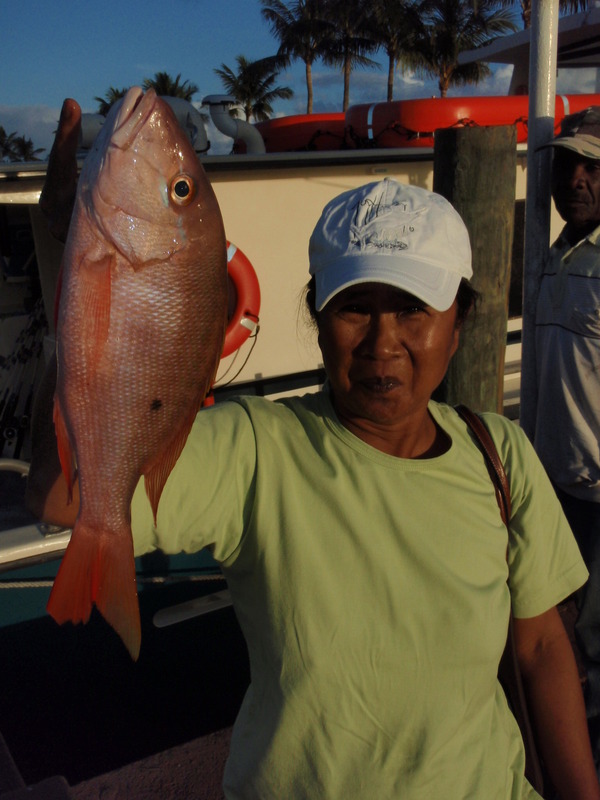 VIP angler Mia shows off her Mutton Snapper caught during an afternoon trip. Along with Mutton Snapper, there has been catches of Yellow-tail snapper as well with a four pound fish being boated during an afternoon trip this past weekend. Other snapper species being landed aboard the Lady K include Lane snapper, Mangrove snapper and some large Yellow-eye snapper. Nice King Mackerel like this 13 pound fish are still being caught as well as Black-fin Tuna up to 10 pounds, large Almaco Jacks and False Albacore. 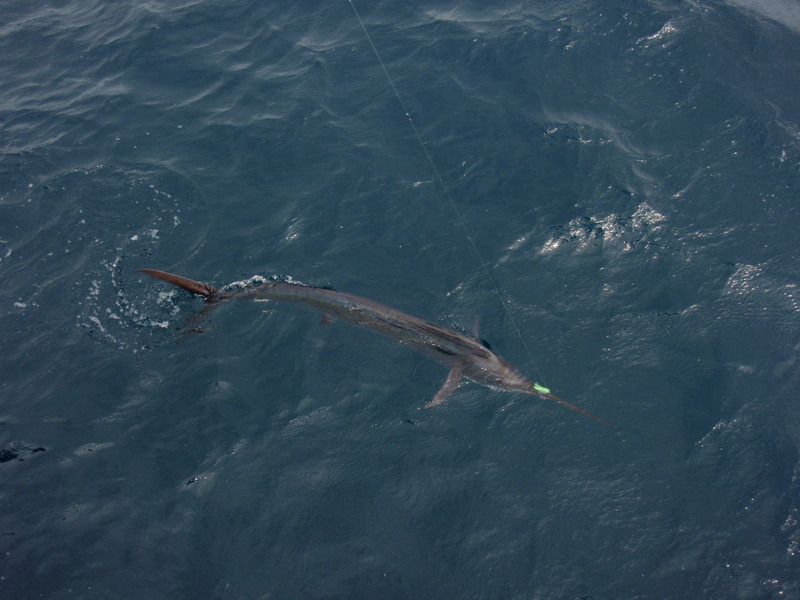 The Lady K has had quite a few Sailfish hook ups and releases by anglers fishing standard sardine rigs. Keep a camera ready for some spectacular aerial displays and for when the fish comes alongside the vessel, like the photo below. No reservations are needed for any of our four-hour trips. Just on down to the dock and purchase your ticket a half hour prior to the sailing time of the trip you would like fish on. We supply everything you, your family or friends will need for fishing. We have plenty of ice for your snacks and favorite beverage so plan your trip today aboard the Lady K.